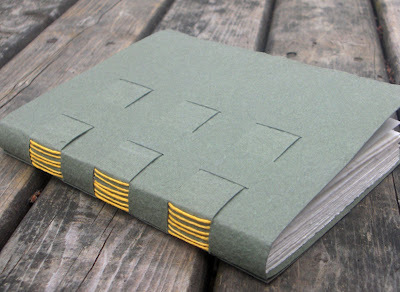 Laura, also known as PrairiePeasant, sent a blank journal made using a crossed structure binding for this swap. The cover is gorgeous Saint-Armand handmade paper and the pages inside are Strathmore petal-inclusion papers. 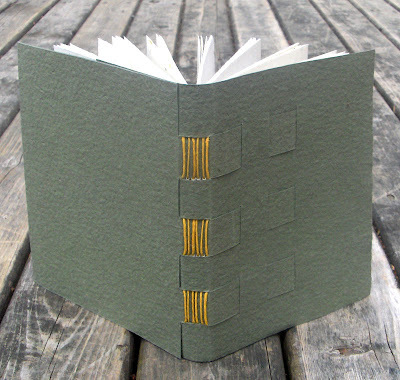 The book is sewn with yellow 20lb hemp twine. You can visit PrairiePeasant.Etsy.com to see more of Laura's work. Really lovely - I like how she's done the spine of the cover! I 'love' Saint-Armand paper. I will have to find some one day. Another beautiful book! The structure looks interesting. I received this one from the swap :) Very sweet. I'm really digging the stratmore 'petal inclusion' paper- wow!